This Cheesy Eggplant Bake is a perfect weeknight dinner – this vegetarian casserole, which feeds a crowd, is loaded with fresh eggplant, baby spinach and fire roasted tomatoes. This dish can be picked fresh from the garden. Roasted eggplant, juicy red tomatoes and fiber rich baby spinach come together deliciously. Topped off with a cheesy crust this casserole is sure to please. 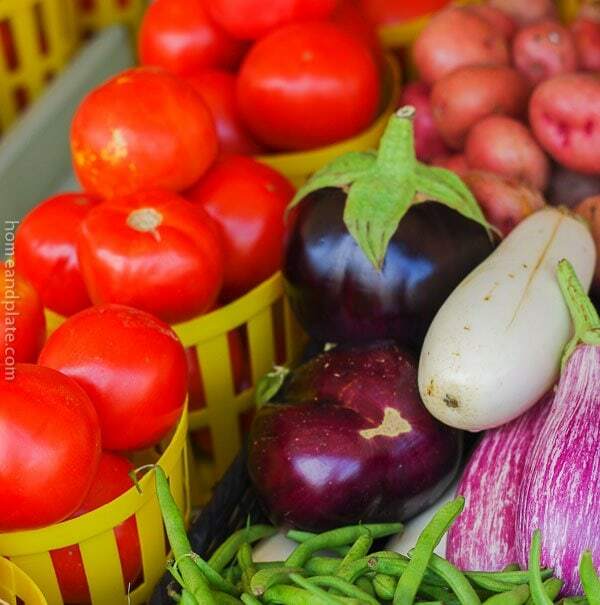 Then head to your local farmer’s market where are you are sure to find the freshest ingredients. But you don’t need to wait for summer or even fall to get your hands on these ingredients. This casserole is delicious any time of the year. I used to make this recipe all the time for my father in law. He loved eggplant and always requested this dish for dinner. Eggplant wasn’t easy to come by in his childhood. I happily obliged. 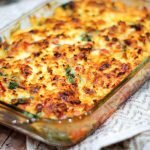 This Cheesy Eggplant Casserole reminds me of him and I still make it regularly. I grow eggplant in the garden and there is nothing like using fresh ingredients like white or purple eggplant, fresh picked tomatoes and fresh spinach leaves. Is this Cheesy Eggplant Bake vegetarian? This vegetarian dish is a perfect side dish or main meal. 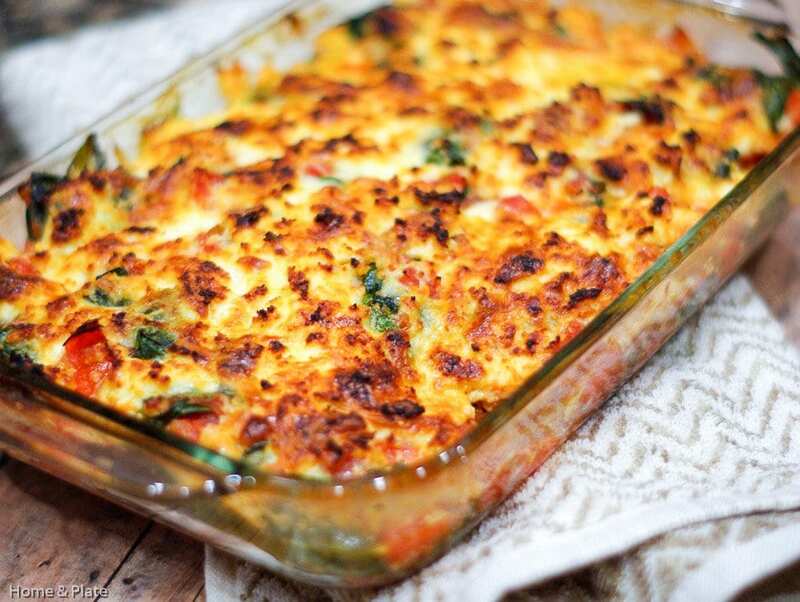 Loaded with spinach, tomatoes and a few other vegetables , it’s the ideal dinner when you want a meatless Monday! And it’s an easy way to prepare eggplant with no frying involved. Throw it all in a casserole dish and this meal pretty much cooks itself. This casserole will be bubbling as it comes out of the oven. Let it sit for about 5 minutes before serving. Enjoy with a class of Cabernet Sauvignon. This vegetarian casserole feeds a crowd. Loaded with fresh eggplant, baby spinach and fire roasted tomatoes, this Cheesy Eggplant Bake is a perfect weeknight dinner. Preheat the oven to 350°F. Place the eggplant slices on a lined baking sheet and drizzle each side with olive oil and season with salt and pepper. Bake for 10 minutes. While the eggplant is baking, combine the mozzarella, ricotta, and Parmesan in a bowl and mix well. Next, in a sauce pan over medium heat sauté the onion for about three minutes until caramelized. Add the garlic, chopped tomato and spinach to the pan and stir until the spinach has wilted. Add the Hunt's Fire Roasted tomatoes to the pan and stir to incorporate. The mixture should be saucy. Arrange the baked eggplant slices in a rectangular baking dish and pour the tomato mixture on top. Sprinkle the top of the baking dish with the cheese mixture, add pepper to taste and cook for 30-40 minutes or until the casserole is cheesy and bubbly on top. I love this recipe. This is my kind of dinner. I love Eggplant, cheese and all the other ingredients this is made with. Thanks for the recipe. Thanks…I agree. My kind of dinner too! This looks amazing! Most of my kids aren’t eggplant fans, but my oldest daughter and I love it, we’ll have to give this a try! Thanks Marye. This dish is the perfect recipe to get kids to taste and see what eggplant is all about. Can’t go wrong topped with all that cheese. I totally need to make this, my kids actually eat eggplant and I think they’d enjoy your version with all the cheese! Lucky you. My kids are not eggplant lovers. I hope your kids enjoy it. Thanks Sara. This looks so good to me! I love eggplant and have some growing in my garden, once they are ready to harvest I look forward to trying this! Eggplant + tomato + cheese is my favorite! Thanks Emily….I love to grow eggplant. It tastes so much better picked fresh. My hubs LOVES eggplant so I’m always looking up new ways to make his eggplant loving dreams come true. This delicious bake looks like just the right thing! I’d love to know nutritional data per serving so that the recipe could be easily translated into WW SmartPoints. Thanks Linda for your interest. While I don’t have a nutritional calculator on my website I was able to pull up some info that might help you. After plugging in the recipe ingredients into an online recipe calculator I was able to get an estimate that I hope helps….Thanks…as long as you go easy on the cheese you should be in a good place. Enjoy! Sounds delicious. I have celiac disease, so I cannot have the traditional eggplant Parm. Do you mean a 13 x 9" baking dish when you say rectangle baking dish? Has anyone tried to make this ahead a few days? Does it work well? Thank you Robin. I love hearing from readers when they find a new recipe favorite. This one must be absolutely phenomenal with homegrown tomatoes. I am definitely going to follow your lead and prepare this soon for my family using all the tomatoes that are growing in my garden. Thanks for visiting.